Raise Media Outrage Shields! Modern Warfare 3's Controversy! THE VIDEO CLIP ABOVE AND THE TEXT BELOW ARE CONSIDERED SPOILERS. You have been warned. Editor's Note: The video has been removed multiple times by Activision. We'll replace it for now, but we will not continue to do so forever. Here comes another reason for the media to go nuts about violence in games; Call of Duty: Modern Warfare 3 features the death of a little girl by way of explosion. The leaked clip comes from Kotaku, and we found it by way of GamePro. Most of us obviously remember the airport scene from Modern Warfare 2 and the media backlash it caused. Russian terrorists went into an airport and openly fired on and killed anyone and everyone in their line of sight. Players walked with the shooters in that scenario, and they could take part in the killing of innocents should they have chosen to do so. Despite the fact that the experience was completely virtual and fake, the media grabbed onto it and ran full steam ahead with the theme of "games are evil" central to every discussion. In the clip above, the action is perceived from a first-person, video camera vantage point. A family is walking through London on their way to visit Big Ben. The young girl in the scene wanders slightly away from her mother. A work truck pulls up, men run out and a massive explosion goes off. It's worth noting that what separates this scene from the previous airport scenario is the role the player takes in each. This scene features no active killing of innocents on behalf of the player; will that dull any of the incoming media anger? As both GamePro and Kotaku point out, the death of a child done in this manner is actually a fairly typical tool in the Hollywood arsenal. For film, doing something like this is an easy way to paint one set of players as obviously evil. It draws a quick line between right and wrong for viewers, and it removes any potential for ambiguity. In video games? It's a new device. 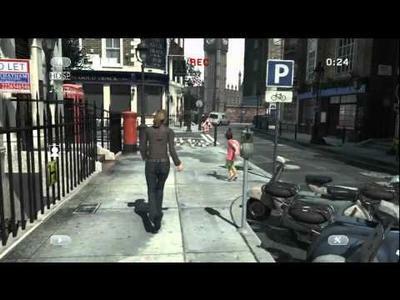 Some viewers and writers have also been suggesting that the decision to include this scene in the game's campaign was made in order to build even more awareness for the product. While I'm not ruling that possibility out, something tells me Activision knows this game will sell well with or without scenes like this one. Are you bothered by the clip above at all? Or, do you see it as a simple plot device not worth getting upset over?